hoops with fabric in them: hoops can be found at any craft store...but i like to get mine at the second hand store. i can get a bundle of them sometimes for as cheap as 75 cents. and the metal ones are a bonus for that price! 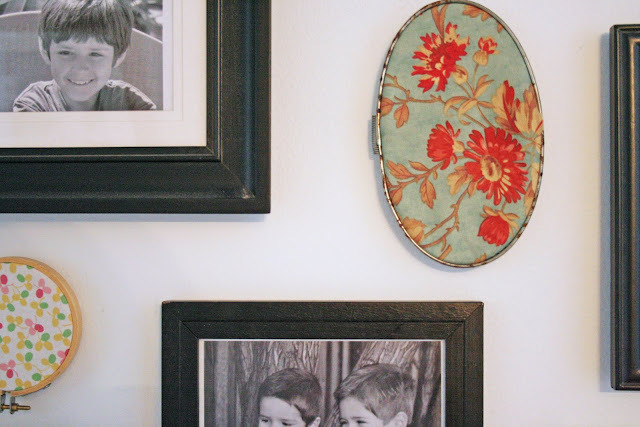 i love to decorate cheaply, so this is a wonderful way to get a bare wall dressed up, and you can always change what fabrics you have in them for the season or for new found favorites! i'm working on some "things"
will post some pics soon! What a great idea - I must keep my eyes open!! I bought a bunch of these at a thrift store for a $1.00 to do the same thing...love your fabric. Cute idea! I love your fabric selection. Love your inexpensive wall art idea but my very favorite is the dresden plate. 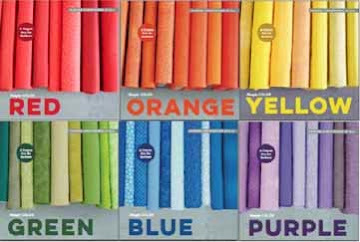 I have some of these hanging in my sewing room. I never thought of decorating with them around my house. Thanks for the idea! 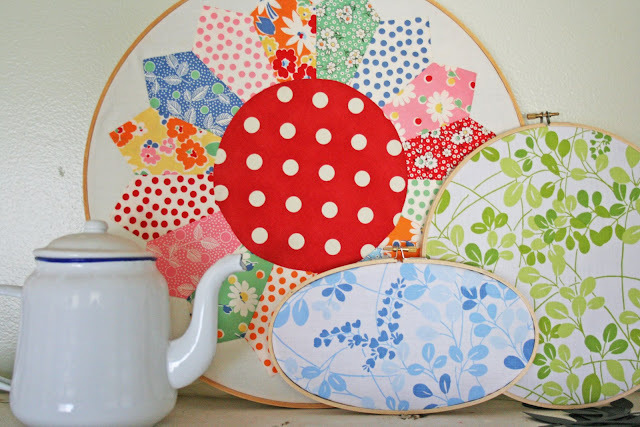 I love your fabrics, and the dresden plate one is adorable. I also put fabric in my hoops and hang them on my wall. Love the little quilted flower. Vanessa...Okay, this one is going in my column. Inexpensive AND nice looking too. What a great idea. Where did you find that fabric? I love the green and blue leaves. I love the metal frame one. I would have never thought of doing this...in fact last year I sold my hoop on a garage sale.....darn it! my fabric that is the lime green and the blue one are vintage sheets found at second hand stores. those two sheets are my absolute favorite sources of inspiration, and my favorite fabrics! These are beautiful! 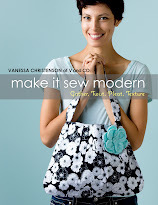 I love the fabrics you've used in them. For my son's nursery, I purchased a couple big bundles of embroidery hoops from the second hand store. Then, painted the solid hoops different colors to coordinate with his room. Then, I just used the hot glue gun to attatch the empty hoops to the wall. The result was great and a inexpensive and easy way to get circles on the wall! Very clever and so colorful too. Great idea. V, these turned out SO cute! And I love that Dresden Plate! Awesome. your dresden plated is beautiful! I L.O.V.E. it... So fresh... I have so many fabrics I love this would be perfect!! I just love that Dresden plate...seriously, it's THE most gorgeous one I've ever seen! love the dresden plate! do they not sell metal hoops anymore? I never see them in stores. I still have one that I use sometimes that was my grandma's. i NEVER would have thought to hang them. I love the hoops with fabric! What a great idea. I am going to try that at my home. Thanks. oh, I will be copying you on this great idea! fabulous idea!! Will have to try this out...thank you for the great pics! Okay, where did my comment go?? I love this idea and have been collecting hoops for some time to do this with. I would love to know where you get the fabric in your oval metal hoop. I have a purse made from that collection-Wuthering Heights, I was told-and NEED more for my half bath. I would love any help you may have. how bout painting the hoops. we had these growing up and so i am slightly frightened about using them, but if i painted the hoops it might work for me. look cute on your wall. I love this, too. I got a bunch of them at the thrift but havent done anything with them yet. and I just picked some hoops up an estate sale... great idea! OK you win...those are completely adorable! Thanks for the inspiration - I've been looking for second hand hoops. . . . Beautiful!!! I am lucky enough to have some old metal hoops that were my husband's grandmothers'! She left me a treasure trove of embroidery floss and notions of that sort. 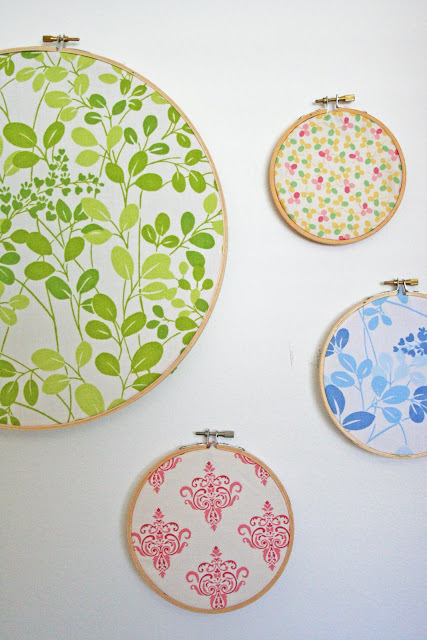 I know exactly what I am going to do with those old metal hoops now...showcase some of my favorite fabrics!!! Now, why didn't I think of that? Thanks for the inspiration! I have a ton of these waiting for me to get to work on it. All of them from thrifting or my grandma's craft stash. I did one for Christmas with a scrap leftover from making stockings too. This is a way late post, but I wanted you to know that I went to goodwill last weekend and FOUND THAT GREEN SHEET! I was so excited, and I said to myself, "This is Vanessa's favorite!!" Of course I bought it all up, with a few other lovelies to go along with it.